I found myself wanting to play around a bit with the traditional Chicken Divan- broccoli, chicken, cream of mushroom soup, etc. etc. Instead, I added cauliflower, made the sauce out of light mayo and sour cream, and threw in some mild curry powder. It turned out well! I think next time, however, I will mix the sauce into the chicken mixture before baking in order to have more of a uniform flavor in each bite. 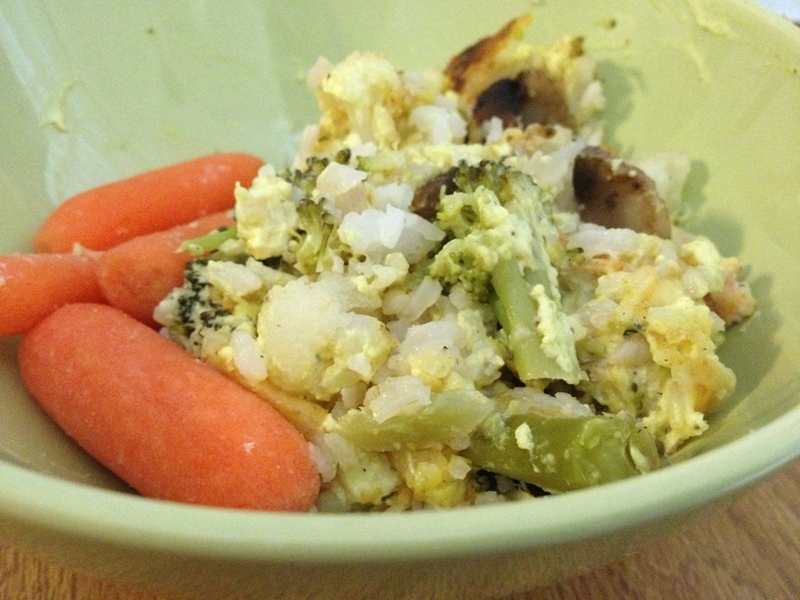 This is definitely an easy way to use up leftover rice, chicken, and veggies! In a medium saucepan, steam or boil broccoli and cauliflower until almost tender, about 8 minutes. Meanwhile, saute mushrooms in butter with garlic powder until almost tender. Defrost chicken breasts (if needed) and sprinkle both sides with seasoned salt. Microwave on high for 4 minutes or until center is no longer pink. Dice into ~1/2″ cubes. Mix mayonnaise, sour cream, curry powder, chicken bullion, and pepper. Add lemon juice and stir into mixture. In a greased 9×9 baking dish, layer rice, broccoli, chicken and mushrooms. Spoon sauce on top. Spread evenly, or mix into vegetables. Top with cheese and bread crumbs. Cover with foil and bake at 350 degrees for 20 minutes. Uncover and bake 10 more minutes, until cheese gets bubbly and delicious-looking!